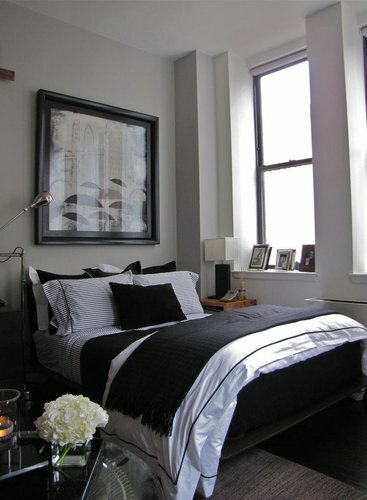 Fellas please take note - - this is how you do a bachelor pad! 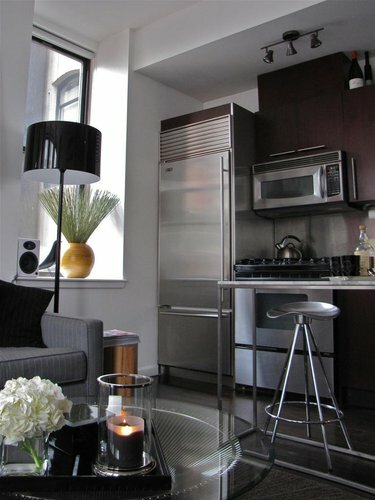 While many men don't take the time to style their spaces, New Yorker Paul does wonders with his 350 sq ft apartment. 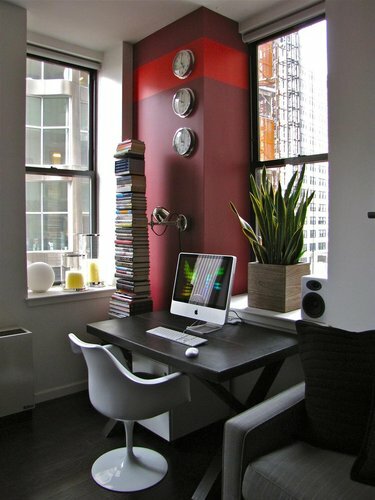 An entrant in the Teeny-Tiny Division of Apartment Therapy's Small/Cool 2011 Contest, Paul has one of the sleekest, most streamlined bachelor pads I've seen. 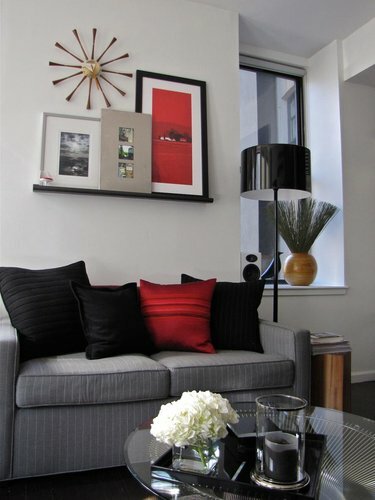 To vote for Paul and his delightful digs click here. 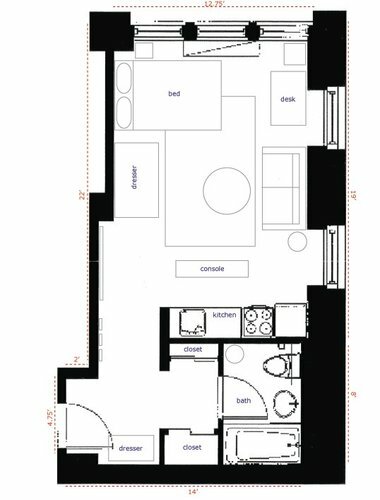 The high ceilings and large windows create a bright, open environment and contribute to make the main room (242 sq. ft) look larger than it is. 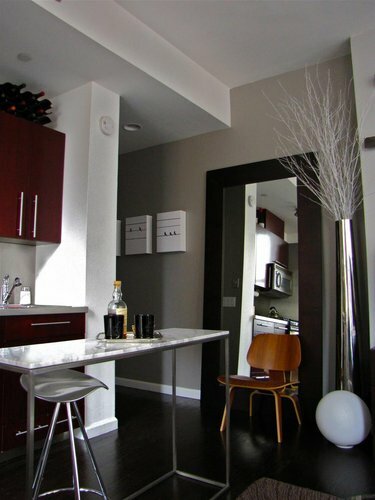 The dark hardwood floors, stainless steel appliances and countertops give the place a very sleek, modern feel, which my furniture and décor complement, while also making the space feel warm and inviting. I’m proud that I’ve been able to collect some classic pieces that function well for lounging, sleeping or working, and can also accommodate social gatherings without having to move a single piece of furniture. Studio living requires that every single thing serves the space well, and this has forced to me to be very selective in what I purchase. Before buying anything, I ask myself, “’What function does this serve?’, ‘How will this improve my space?’ and ‘Will I want to own this 10 years from now?’” One result of looking at everything I own all the time, is that I constantly want to add new elements — yet I realize adding a new item means I have to get rid of something else. My apartment was a featured house tour in January (http://www.apartmenttherapy.com/ny/pauls-perfectly-suited-studiohouse-tour-139847) and since the only additions I’ve made since are the two glass hurricanes in the window to the left of the desk. It took me three days to figure out where to put them and what they would replace!